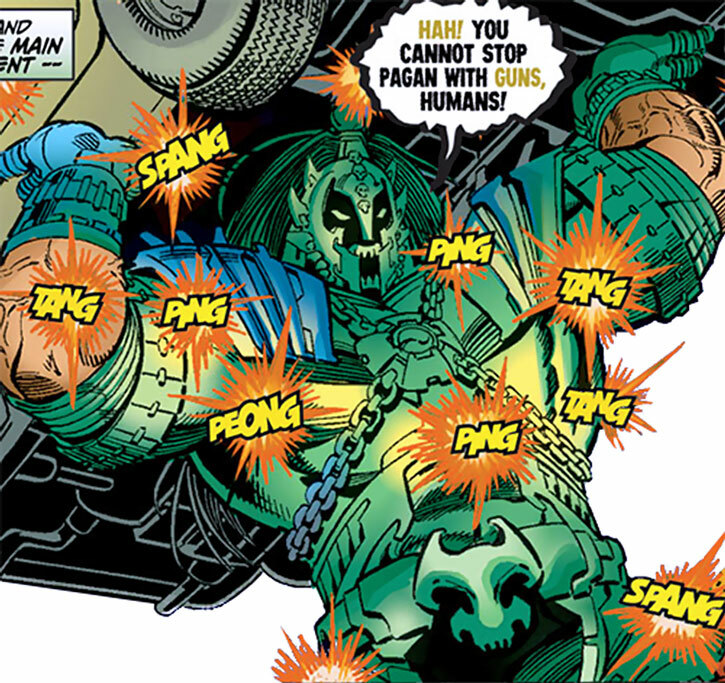 Pagan was a recurrent opponent during the 1998 Avengers run. 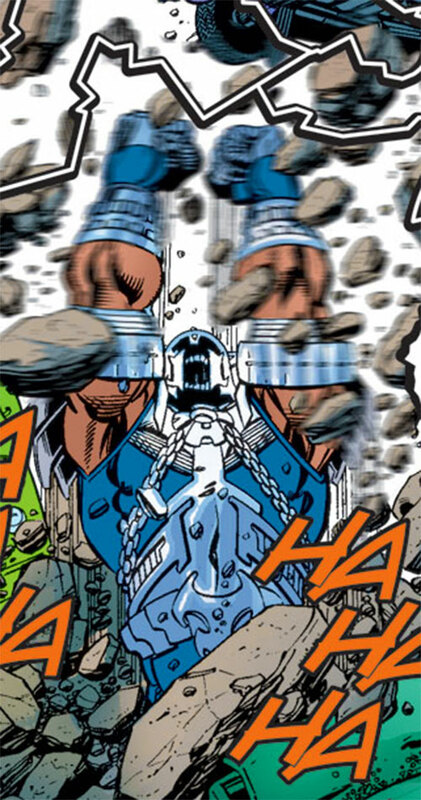 Written by Kurt Busiek, the entire run was a complex set of epic menaces interlocked together. For more context about Pagan, it is best to first read the Jonathan Tremont character profile. Known Relatives: Jonathan Tremont (brother), unnamed brother (Lord Templar, deceased). Group Affiliation: Agent of Jonathan Tremont. Height: 9’ Weight: 500 lbs. Superhumanly strong and durable. His punches were compared by Wonder Man to those of Count Nefaria. He went toe-to-toe with Thor, apparently winning. It took Wonder Man and the Vision at diamond hardness dive-bombing him together to knock him off his feet. Even that didn’t knock him out. He also seems to grow when engaged in combat, becoming even stronger as necessary. Able to burrow through the Earth using his great strength, his power seems to have some basis in chaos magic. So he’s able to take blasts of it with little effect, but attempts to drain chaos magic weaken him. See the Jonathan Tremont entry for the History. Rough and straightforward, Pagan loves to fight and destroy things. Or at least this is the persona he’s shown. Since he also appeared to be an enemy of Lord Templar it’s unclear how much of his battle-lust is faked. Although it seems likely he does enjoy it to some degree. Growth can only be increased by 1 AP per Phase, while taking Damage (-1) but 2 AP is Always on (-1, STR APs shown in parenthesis). Magic Field only works against chaos magic (-1). Lightning Reflexes, Rich Family (Jonathan Tremont). Jonathan Tremont (High), Lord Templar (High). Strange Appearance, Miscellaneous Drawback (Attempts to drain chaos magic Powers work on his Powers). It’s not clear what causes him to grow. 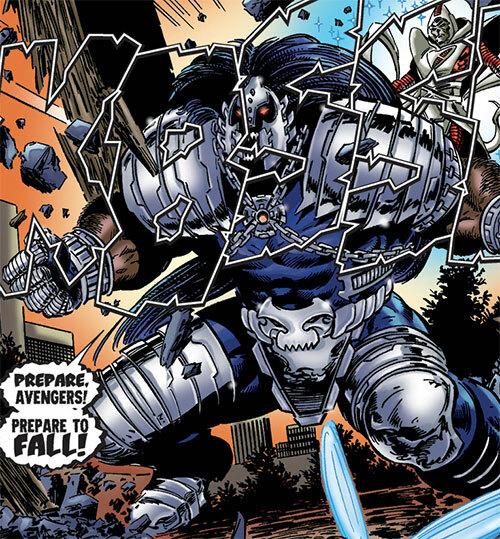 But since he seems to get bigger while fighting significant opposition, I’ve assumed taking damage is the cause. 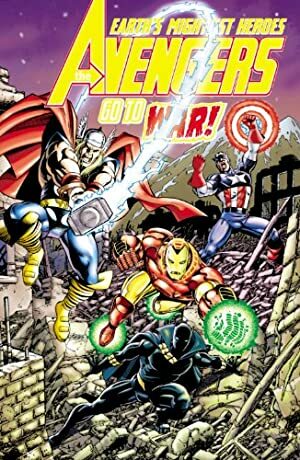 Source of Character: Marvel Comics (Avengers vol. 3, various issues between #13-50, written by Kurt Busiek). Writeup completed on the 26th of February, 2012.